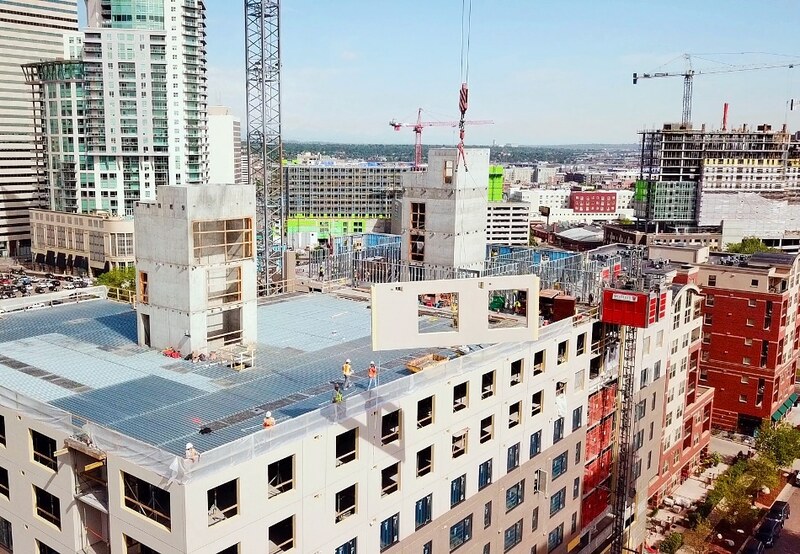 On July 20th, The Weitz Company accomplished a major step by delivering 211 new apartments in downtown Denver when it topped out SOVA, a 12-story multi-unit residential project for developer McWHINNEY in the city’s Uptown neighborhood. SOVA is located at 1901 Grant Street, and integrates construction innovation and LEED green building to deliver the highest value to project stakeholders and future residents. It is being constructed using multiple prefabricated construction techniques with materials and systems designed to help the project attain LEED Silver certification. We stretched the imagination of what can be accomplished at SOVA with our trade partners. Some of it was driven by circumstance but every decision was purposeful in order to create value for McWHINNEY and a final product that will generate pride and satisfaction. The most technical component of SOVA was the exterior walls. They were prefabricated off-site in 10-foot tall by 20-foot wide panels (on average) and then shipped on a flatbed truck over a six-month period for installation. Manufactured by Littleton, Colorado-based South Valley Prefab, the wall panels were delivered 100% finished, requiring just windows to be inserted to complete the exterior skin of the building. Operating on a zero lot line jobsite that has minimal space for material lay down was one factor in choosing prefabricated exterior walls. Two others were forming a predictable project schedule in a competitive labor market and cutting off over $1 million from the project budget by not scaffolding the building. Integrating other prefabricated systems such as the plumbing and electrical—along with utilizing the Infinity metal framing system on the interior—led Weitz to form a big room atmosphere with all project stakeholders and trade partners before initiating construction. The open planning enabled the project to be completely built in a virtual environment, increasing cooperation with all team members, and eliminating potential problems during construction. Overall, SOVA will provide residents a first-rate living experience in a very sustainable building that represents the best of modern construction with amenities such as a golf simulator; fourth-floor courtyard with adjoining fitness center; hot tub; and rooftop deck with lounge and barbecue area.